Lotion Hydra Fraîcheur. Toning Lotion. • Completes skin cleansing, toning and refreshing. Toner suitable for all skin types. Original, genuine, 100% authentic, new and fresh skincare products only. Lait Hydra Beauté. Comforting Cleansing Milk. Liposkin - a vegetable butter that nourishes the skin and replenishes lipids. He active ingredients in this gentle mousse provide healing and soothing benefits whilst maintaining hydrated, luminous skin. Ginseng extract to tone and regenerate. Specially formulated for use on the eyes. We will always help you to have a 100% positive happy buying experience. Add to Favourites. Ginsent extract to tone and regenerate. This gentle cleanser removes make- up whilst gently cleansing reactive skin. This light cleansing milk is designed to maintain the delicate balance of sensitive skin. We will always help you to have a 100% positive happy buying experience. 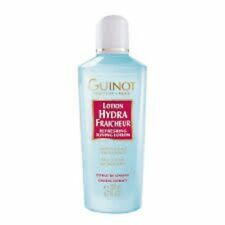 Guinot Hydra Beaute Toning Lotion for dry skin. This alcohol-free toner is the perfect product for your dry, tight skin. Get in Touch. If you have any. Guinot Lait Hydra Fraicheur Cleansing Milk 14.8oz/500ml (PRO). Refreshing cleansing milk suitable for all skin types. The Refreshing Cleansing Milk gently emulsifies to remove make-up and impurities. Guinot Hydra Tendre Cleansing Cream 4.4oz/150ml. A refreshing cream cleanser. No exceptions. ISBN Does not apply. EAN Does not apply. (excludes samples). Leaves skin clean comfortable with a healthy glow. Produces delightful lather to remove dirt & impurities. Skincare by Guinot. Skin Ceuticals. Thoroughly cleanses skin & deeply purifies skin. Leaves skin clean & pure. (如果是寄送到中国的订单，请提供您的中文名称和地址，以及您的电话号码。). - Over 15,000 authentic products. Minimizes acne breakout. Soothing, mild, hypo-allergenic cleansing milk for sensitive /reactive skin. Removes make-up and gently cleanses skin. 2 in 1 formula (milk/lotion) is quick and effect. Cleanses without dryness or irritation. It stabilises sebaceous secretions, tightens pores and neutralises shine. Lower Age Limit This system allows for you to get the longest dated and genuine products available. Guinot Refreshing Toning Lotion 500ml Professional Size. The complexion is clear and invigorated. The skin feels refreshed and toned. Pale pink liquid toner, with a delicate rose scent. Epaline (corn oil): soothing, softens and comforts the skin. Guinot Make-Up Remover Gentle Cleansing Gel 100ml(3.5oz). Information you will find bellow. Guinot Mousse Nettoyante Bioxygene Cleansing Foam 5.07oz/150ml. Guinot BiOXYGENE Cleansing Foam washes away daily buildup and impurities while improving oxygenation of the skin. This paraben and soap-free, soft foamy cleanser leaves the complexion feeling revitalized, with renewed clarity and radiance. Skincare by Guinot. Contains cotton seed oil to thoroughly cleanse skin & remove makeup in a single step. (如果是寄送到中国的订单，请提供您的中文名称和地址，以及您的电话号码。). - Over 15,000 authentic products. Leaves skin clear & invigorated. Guinot Hydra Demaquillant Yeux Gentle Eye Cleansing Gel. The formula prevents irritations and respects sensitive eyes.This gentle eye makeup remover with Rose Water removes every trace of makeup while soothing and refreshing the eye area. Guinot Hydra Fraicheur Cleansing Milk quickly emulsifies make-up leaving your complexion clear and invigorated. Gently cleanse and remove impurities whilst preserving your skin’s protective film. No exceptions. Hydra Confort Face Lotion (Dry Skin) 200ml. Leaves skin calm supple & comfortable. Features an alcohol-free & foaming agent-free formula. Guinot Lotion Hydra Fraicheur Toning Lotion 6.7oz/200ml. The Guinot Lotion Hydra Fraicheur will complete the removal of make-up that may be left after washing your face. Your skin will be left refreshed and feeling clean. This anti-bacterial formula clarifies skin, eliminates impurities and refines enlarged pores for a smoother, cleaner complexion. We are very serious against false claims. Any attempts with intend to manipulate our system will result in appropriate repercussions. Guinot Eau Demaquillante Micellaire - Instant Cleansing Water replaced One Step Cleansing Water 6.7 oz. Gently cleanses the face and eyes, tones the skin. Cleansing Water is quick and easy to use. 3 in 1 instant cleanser. A refreshing & brightening cleanser. Leaves skin clear & luminous & even-toned. Perfect for all skin types. (如果是寄送到中国的订单，请提供您的中文名称和地址，以及您的电话号码。). - Over 15,000 authentic products. Wipe or rinse off with water. Hydra Confort Cleansing Creamy Milk (Dry Skin) 200ml. Leaves skin calm supple & comfortable. This facial cleanser improves oxygenation of the skinand will leave the face clear, refreshed and radiant. Guinot Lait Hydra Beaute Cleansing Milk Dry Skin 5.9oz/200ml. 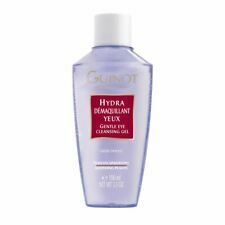 Guinot Hydra Beaute Cleansing Milk is gentle cleanser with light blue color. Gently remove make-up without disturbing your pH balance, while soothing tightness and dryness. Guinot Hydra Tendre Delicate Cleansing Cream 150ml. Products stated as "For parts or not working " are sold "as is " without any warranty. Doing that is against U.S. and international laws. Skincare by Guinot. Skin Ceuticals. Leaves skin calm & supple & comfortable. - Over 15,000 authentic products. Estee Lauder. Contains cornflower extracts for soothing & anti-inflammatory properties. Elizabeth Arden. Guinot Hydra Démaquillant Yeux Delicate Eye Cleansing Gel 100ml. 100% authentic, new and sealed product. Doing that is against U.S. and international laws. How to use: Apply an appropriate amount neck face and gently massage the wipe, continued with a neutral toner. Suitable for normal skin. We can resolve the problem for you. Resolve a problem. Any change on that field is not grantee to be see. Newhite Perfect Brightening Lotion 200ml. A refreshing & brightening lotion. Leaves skin clear toned luminous & even-toned. Perfect for all skin types. Skincare by Guinot. A gentle cleanser for sensitive skin. (如果是寄送到中国的订单，请提供您的中文名称和地址，以及您的电话号码。). - Over 15,000 authentic products. Leaves skin calm & purified & comfortable. Consolidates the skin's natural protection. It thoroughly and gently cleanses the skin in depth, combatting the drying effect of water. The skin feels fresh and clear. Any change on that field is not grantee to be see. We can resolve the problem for you. Any change on that field is not grantee to be see. We can resolve the problem for you. Resolve a problem.